This issue’s selection features ultra low energy buildings from Mexico, Germany, New Zealand and Italy, and illustrates how widely the energy efficiency specification can vary in different climate zones. Mexico’s first certified passive house is the retrofit of a roof-top apartment in the country’s capital. This small space was originally built cheaply in 2007, mostly with plywood. But while living in Germany, Mexican architect Alejandro Herrera trained in the principles of energy efficient building. When he returned to his homeland in 2011, he decided to upgrade the apartment — his home — to the passive house standard. Herrera led the project along with Maris Igea, his partner at Inhab Sustainable Architecture. But in some ways, meeting the passive house standard was easier in the warm Mexican climate. The apartment achieves a space heating demand of 15 kWh/m2/yr with double-glazing, with wall, roof and floor U-values of between 0.3 and 0.4. 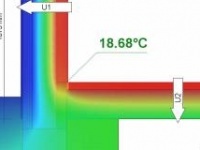 Heat recovery ventilation was not required either, just simple mechanical extract ventilation. The team insulated the entire building envelope with EPS, and airtightness is provided by the OSB along with Siga tapes and membranes. Now, a single electric heater is enough to heat the whole apartment. The architects say: “A lot of collaborative work took place, it involved a big effort and a deep commitment, and it was all worth it.” The finished building is not just the first certified passive house building in Mexico, it’s also the first certified passive residential building in all of Latin America. Completed in 2010, this day centre for Göttingen University was designed by Despang Architekten, who describe it as a “hybrid of landscape and architecture”. The building’s north and west facades are earth-bermed, but the south facade forms a passive solar curtain-wall with views to the outdoor playground and landscaping. This glazed facade is comprised of a timber-aluminium post-and-beam structure with extensive tripleglazing. The walls and ceilings were constructed from large, prefabricated concrete elements to minimise the number of joints. The walls were externally insulated and the building is topped with a green roof, while the earth-bermed surfaces help to reduce energy loss, too. 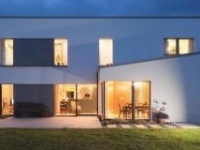 The building achieved an airtightness result of 0.43 ACH, comfortably within the target for passive buildings, and has a space heating demand of 15 kWh/m2/yr. The material palette inside — concrete, glass, spruce wood, linoleum — was in part chosen to avoid off-gassing materials, and the concrete finishes are extended outside the building via thermally broken concrete frames. These external concrete elements are functional too: they provide seating at their bases, guard rails for the roof, and static shading. 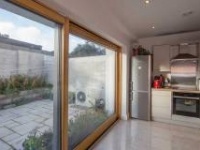 The concrete frames also contain dynamic shades which can be pulled down in summer to control overheating and glare. 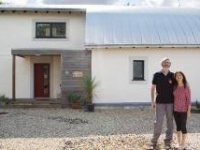 New Zealand’s first certified passive house started out typically enough: architect Darren Jessop was approached by Phillip and Carolyn Ivanier, a couple wishing to build their first family home. They wanted a modern open-plan family dwelling, and a degree of separation between the ‘adult’ and ‘child’ spaces. But with the design already settled, and prompted by New Zealand’s low building insulation standards, the clients made a game-changing request: that the dwelling meet the passive house standard. The windows were minimised on the south side of the home — where they would lose heat in the southern hemisphere — and overhangs were extended over the north-facing glass to prevent overheating. Ventilation is provided by a Zehnder heat recovery ventilation system, while an air source heat pump delivers hot water. The house also has rainwater collection and solar photovoltaics. This striking certified passive house in the Italian Alps was designed by architects Arthur Pichler and Walter Colombi. The brief was to design a sustainable, open-plan building with ultra low energy consumption. The top floor of the building contains a single flat with its own entrance — made possible by the sloping site — while the two-storey flat below leads directly onto the garden. In winter, the glazed south facade acts as a “solar stove”, the architects say, to deliver passive solar heating. Orienting the building to the south shelters it from the harsh northerly alpine winds too. The timber frame walls and roof are insulated with Thermohemp, while the floor has a meaty 420mm of extruded polystyrene insulation. The building’s annual heat demand is just 9 kWh/m2/yr, well inside the passive house mark of 15, and airtightness is 0.4 air changes per hour. Passive House Pichler also has a green roof that helps to keep it warm in winter and cool in summer — and soaks up rainwater too. And as one of its architects, Arthur Pichler had special motivation to get the house right: he lives on the lower floors with his young family, while his parents live upstairs.